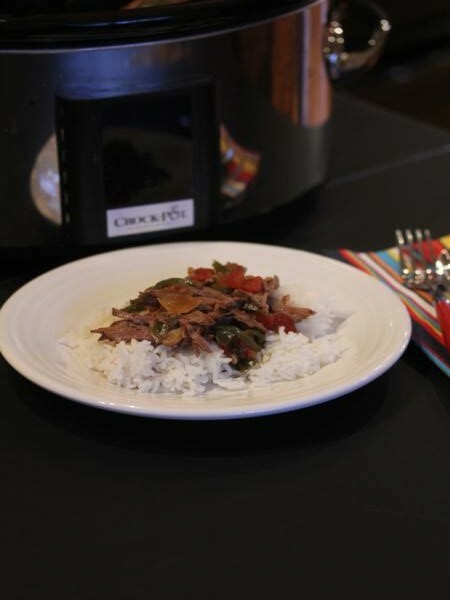 Slow Cooked Pepper Steak is a recipe I have been making for almost twenty years and I can’t believe I have never shared it with you all. The lack of a good picture might have been part of the reason. Meat cooked all day in the slow cooker, may not be pretty, but it sure is good! My sisters and I found this recipe in a magazine years ago. I wrote it down on a recipe card before I was even married and I have been making it ever since. This is one of those recipes that is simple to make and uses everyday ingredients. 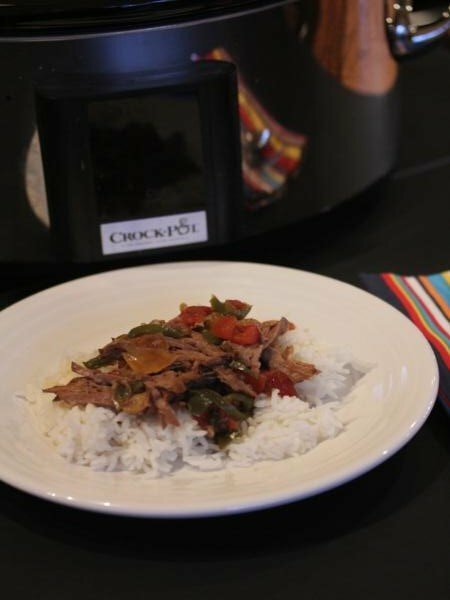 And since it cooks all day in the slow cooker, it is perfect for those cheaper cuts of meat that are a little tougher, because after cooking all day the meat will fall apart and be delicious. I can’t even begin to count how many times I have made this over the years. It is so easy and so good! 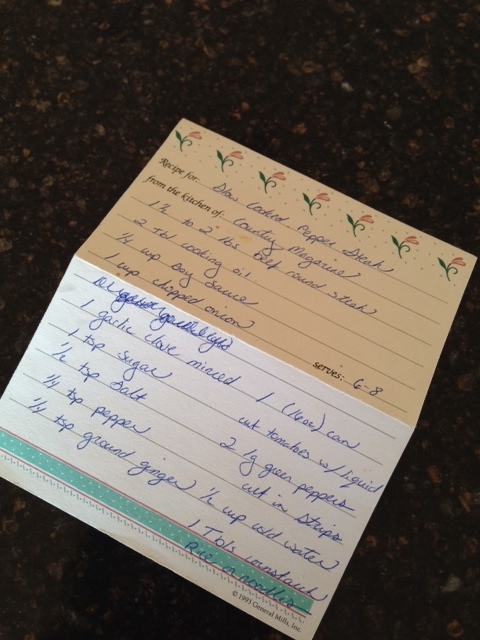 And does anyone else miss hand written recipe cards? In this internet computer world recipe cards are becoming a thing of the past. I still love them though. There is just something about hand written recipes that just can’t compare to one on a computer screen. It always seems that hand written ones tell more of a story. Of course maybe the fact that I am partial to recipe cards means I am getting old or at least it is probably a sign of my age. Does anyone else feel the same way I do? Heat oil in pan and brown beef strips. Place browned meat into slow cooker. Combine the soy sauce, onion, garlic, sugar, salt, pepper, ginger, and tomatoes, and pour over meat. In a small bowl combine cornstarch and water and add to slow cooker. Cook on high until slightly thickened. This will take 30 minutes or so. Looks delicious! I’m sure my family would love this! I have several packages of tenderized round steak that we got when we split half of the half of beef with my MIL. I have never used tenderized in anything. Would it work with this recipe and if so, do I need to adjust the cooking time? You have given me so many recipes (regular and gluten free) to add to my meal plan that I think this one would work despite my dislike of green peppers. But with a big serving of rice, I’m willing to try! Thanks Lynn.